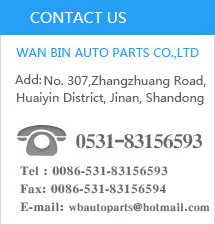 WAN BIN AUTO PARTS CO.,LTD, establisted in 2005,is specialized in manufacturing and distribution of the automotive sensors . As an ISO 9001:2008 certified company, Wanbin, with the constant spirit of innovation and the excellent technology concepts,focuses on developing and improving the products, are committed to supplying the highest quality products to meet the clients’ various requests. Science and technology creats the future and the high quality makes the brand. We will do our best to offer the excellent products and professional service and make a famous enterprise with you.